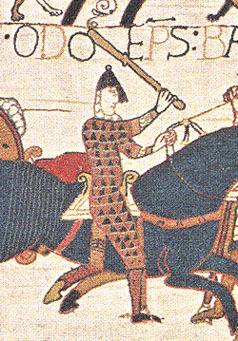 Norman bishop and English earl, a uterine brother of William the Conqueror, from whom he received, while still a youth, the see of Bayeux (1049). But his active career was that of a warrior and statesman. He found ships for the invasion of England and fought in person at Senlac; in 1067 he became Earl of Kent, and for some years he was a trusted royal minister. At times he acted as viceroy in William's absence; at times he led the royal forces to chastise rebellions. But in 1083 he was suddenly disgraced and imprisoned for having planned a military expedition to Italy. He was accused of desiring to make himself pope; more probably he thought of serving as a papal condottiere against the emperor Henry IV. William The Conqueror, when on his deathbed, reluctantly permitted Odo's release in 1087. The bishop returned to his earldom and soon organized a rebellion with the object of handing over England to his eldest nephew, Duke Robert. William Rufus, to the disgust of his supporters, permitted Odo to leave the kingdom after the collapse of this design (1088), and from that point forward Odo was the right-hand man of Robert in Normandy. He took part in the agitation for the First Crusade, and started in the duke's company for Palestine, but died on the way, at Palermo (February 1097). Little good is recorded of Odo. His vast wealth was gained by extortion and robbery. His ambitions were boundless and his morals lax. But he was a patron of learning and, like most prelates of his age, a great architect. He rebuilt the cathedral of his see, and may perhaps have commissioned the unknown artist of the celebrated Bayeux tapestry.